From the airport taxis go direct to your ship. The airport is at only 11 km from the cruise port. Alternatively you can use the excellent public transportation. Most (turnaround) cruise ships dock here. With 4 terminal buildings it is the busiest pier. 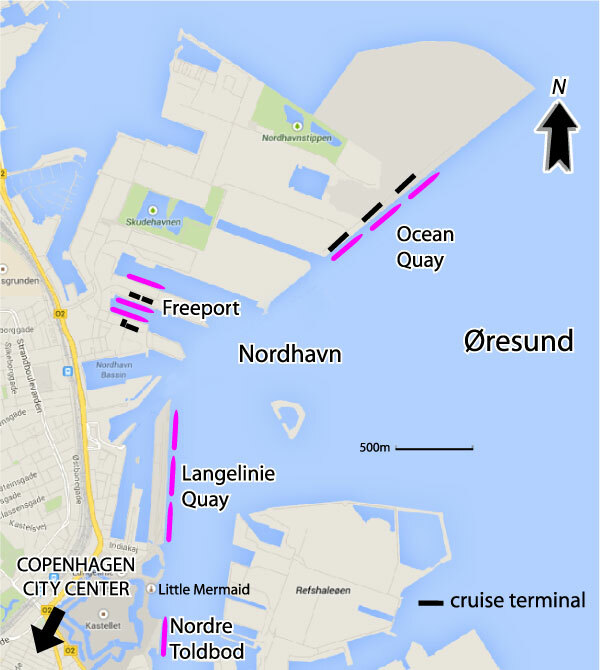 Copenhagen Malmö Port's board gave the go-ahead to build a new cruise terminal in Copenhagen. It will be located beyond the current Oceankaj in Ydre Nordhavn and capable of handling more than 5,000 passengers per call. The terminal is expected to open in 2020. 2. Freeport: c252+c254, now seldom used. From the Oceankai terminal you can take bus 25 or 27 to Nørreport Station which is in the center of town. From there take the metro to the airport. Price from the airport to central Copenhagen or the piers is 36 DKK From central Copenhagen to the piers is 24 DKK. If many ships are in port, lines might get long, consider a taxi instead. On days with cruise ship arrivals at Oceankaj (Ocean Quay) the 25 shuttle service operates between Oceankaj, Østerport St. and Nørreport St. from 8 am until 1 hour before the last cruise ship departure. The shuttle service operates approximately every 20-30 minutes. You can purchase your tickets at most stations and a number of kiosks. 3. Langelinie: c190 to c199 Most used by smaller visiting ships. Take the Metro from Copenhagen Airport to Nørreport Station. Change to S-train A, B, C or E-line and take the train 1 stop to Østerport Station. From here there are 15 minutes walk to Langelinie or to Nordre Toldbod. From the pier of Langelinie (as shown on the map below), it is only a pleasant 30-minute walk to the city center. You can take a short walk from Langelinie Pier to see the Little Mermaid statue or Amalienborg Palace. Langelinie's promenade is lined with plenty of shops, casual cafes and more. Cruise schedule and which dock will be used. Map of the different cruise terminals. The Hop on/off buses of CitySightseeing are always present at all cruise terminals and offer 3 tours in and around Copenhagen. Printable map to take along.Check here for festivals and events in Copenhagen when you are in port. Copenhagen is a charming city of 17th- and 18th-century buildings, beautiful parks and gardens, pretty promenades along canals, and ancient winding streets made for walking and biking. Add to that the longer days and warmer weather in the summer. The city's architecture soars from medieval to rococo, and style varies from eclecticism to the cool designs of Arne Jacobsen. The impact Danes have had on the world of contemporary interiors is second only to their expertise in fairy tales. On forehand you may purchase online via the tourist office the Copenhagen Card which entitles you to free entry to 60 museums and attractions as well as free transport by train, bus and Metro (also to and from the airport), discounts on restaurants, car hire, and many attractions and includes a comprehensive guide. Note: Some museums have free admission anyway and most don't charge entry fees on Wednesdays. In a hurry: Take the harbor water bus (901/902) from either The Royal Library also called the black diamond for its sun/water reflections to Nordre Tloldbod, close to the Little Mermaid or vice versa for the price of a regular bus ticket. Every 20 minutes: a 15-minute tour of all waterfront highlights! Rent a City Bike for free: just deposit a coin of 20 Kroner, take your bike, and drop it off after you are finished at any point and get your money back. Public transportation is very good. Just to the north, along the Øresund coast, stretch a series of well-heeled suburbs: a visit to their attractions – the Danish Aquarium, Experimentarium and Bakken amusement park among them – can be followed up by lazing on the adjacent beaches. The Louisiana Museum of Modern Art is situated 35 km north of Copenhagen on the North Zealand coast in a spacious, old park with a fine view across the sound of Sweden. Malmo Sweden: Take a 35 minute train trip over the spectacular Oresund Brige. In the old center the Strøget area is actually a collection of pedestrian streets, filled with shops, cafes and restaurants, that spread out from this central thoroughfare. These streets are between the large squares, east in Kogens Nytorv and west in Radhuspladsen (The City Hall Square). You won't find the name Stroget on the street signs or on city maps, but if you ask a Copenhagener where to find Stroget, you will probably get a clear answer. Eating and drinking out is quite expensive, but the possibilities are endless: from red hot Thai curries to traditional 'frikadeller' (Danish meatballs), from sushi to the typical smørrebrød, which are served at lunch: these open sandwiches have all kinds of savory toppings, typically including boiled egg and dill, beetroot, mackerel, roast onions, cold meats and goose or pork dripping. There are also takeaway smørredbrød kiosks throughout the city center. Denmark has the highest Tax (VAT) rate in Europe: 25% on everything! Denmark is not part of the EURO-monetary system, but major shops will probably give prices both in Danish kroner and in EURO (€). Most major international credit cards are accepted in Denmark. But be aware that a surcharge of 2 to 4 percent is often added, which is legal outside the USA. Mon-Fri: 10 am-7 pm, Sat: 10 am-4 pm. On Sundays shops are normally closed but during the cruise season some department stores and malls are open.